High Quality Content by WIKIPEDIA articles! Muscle atrophy is defined as a decrease in the mass of the muscle; it can be a partial or complete wasting away of muscle. When a muscle atrophies, this leads to muscle weakness, since the ability to exert force is related to mass. 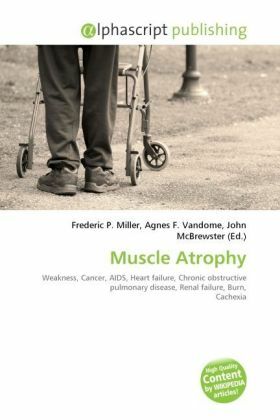 Muscle atrophy is a co-morbidity of several common diseases, including cancer, AIDS, congestive heart failure, COPD, renal failure, and severe burns; patients who have "cachexia" in these disease settings have a poor prognosis. There are many diseases and conditions which cause a decrease in muscle mass, known as atrophy, including: Dejerine Sottas syndrome, inactivity, as seen when a cast is put on a limb, or upon extended bedrest; cachexia - which is a "body-wasting" syndrome that is a co-morbidity of cancer and Congestive Heart Failure; Chronic Obstructive Pulmonary Disease; burns, liver failure, etc. Other syndromes or conditions which can induce skeletal muscle atrophy are congestive heart failure, liver disease, and starvation.